Welcome to the Dark Return. Now, Resly has been missing for over two weeks. The City Guard has investigated and found no trace of Resly, save a rumored visit to a traveling circus. His house sits abandoned and watched over by the Guard. Rumors have started to circulate that Silas may have eliminated his biggest opponent. To clear his name, Silas has hired you to look into the disappearance and report back with anything you find. Explore the strange and mysterious Todaren Family Circus. Look for clues to explain Resly’s disappearance. Explore the cemetery during the unnatural storms that have been increasing in severity. Continue to forge your own legacy in the chronicles of Ferryport. 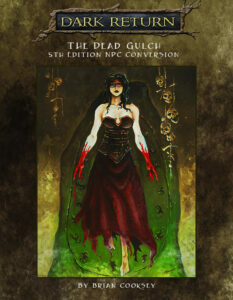 The Dead Gulch is a Pathfinder Roleplaying Game-compatible roleplaying adventure designed for 4 to 6 characters of 2nd level. This adventure is part 2 of the Ferryport Adventures: Return of the Fey adventure path, set in the dark world of Uteria. The adventure is “node based“, which means that players can choose their own path, discovering locales and clues as they follow their own investigations and intuitions. The characters will advance from level 2 to level 4 by the end of the module. The book comes with 7 pre-made characters who all hail from different parts of Uteria. The book will also include the Tome of Magic, wherein we describe the various magic groups of Uteria, as well as the play mechanics for our mana-based magic variant. In this magic system, you can memorize your spell allotment for the day, then use mana to cast any assortment of spells from your memorized list. Since training is difficult to find in Uteria, many magic users start out as a wylder: an untrained mage with undisciplined abilities. We also provide a list of all Pathfinder core spells that are compatible with Uteria, as well as Uteria-specific spells with descriptions. The adventure comes with 7 pre-made Uteria player characters, so players can jump right into the adventure. The Dead Gulch 5E NPC conversion Guide – Play in the Dark Return with 5th Edition rules!